Springtime is peeking through the stormclouds here in Sacto, leaving me a little giddy as I browse through the produce department. I’m in love, and it tastes soooo good. 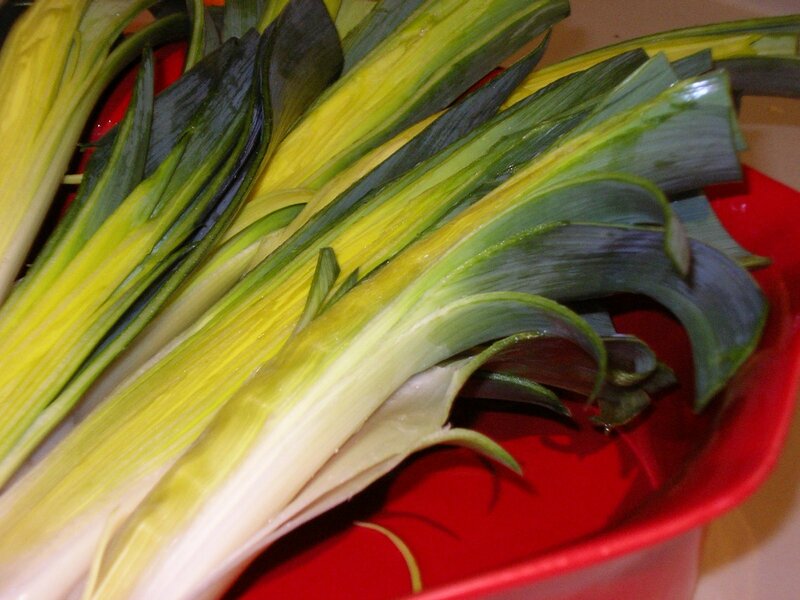 Leeks are the very color of spring – fresh, light, sunny green in the middle, tinged on either side with snow-white and deep black-green. They have a sweet, earthy, unmistakably springtime flavor that I can’t stop putting in my dishes. Quiche, soup, omelets, and this: an easy Spring Vegetable Pie based on MaryJane Butters’ BakeOver dish. In a castiron pan I sauteed leeks, garlic, kale, mushrooms, and a pear in butter for about 5-7 minutes, then stirred in pre-cooked butternut squash. I sprinkled grated cheddar on top, then laid a rolled-out crust dough on top of that. Stuck it in a 425-degree oven for 20 minutes, turned out onto a cutting board and sliced in after a few minutes’ rest. The taste was wonderful! Don’t get hung up on the pear – it was an awesome addition, but you can combine pretty much whatever you want – veggies, fruits, meats, cheeses. An easy, elegant one-dish meal. What food says SPRING to you? I need to think about my spring food…here in Portland, I am always struck by the spring yards and trees. Our cherry blossoms are just starting to bloom (in February! as a midwestern girl, that always amazes me) and daffodils and tulips are popping up all over. As my friend said recently, “Everything is just Bursting!” I love it! Here too!! The camellias are in full bloom all over town leaving large pink plates on the ground when they drop. But also the fruit blossoms! So beautiful. I have a bouquet of white tulips and purple hyacinth from Trader Joe’s in my family room, and they are sooo fragrant! Springtime is just around the corner,well I thought so until I was stuck in a snow storm last weekend in DC….nothing like the beauty of the “greens’ sprouting up from a long winter nap….. The hyacinths are just starting to peek out of the soil in my yard. However, I noticed that my chives are already starting to thrive! Nothing says spring to me like cottage cheese with chives. Reminds me of eating at my Gram’s in the springtime. Really enjoy your blog. I’ll be back! Thanks for visiting, Turtleheart! I really like your blog too – couldn’t figure out how to comment on it though. What a beautiful crochet design by Laura Ingalls Wilder!